A new joint program in Public History through Brandon University and Assiniboine Community College will be the first in Western Canada. 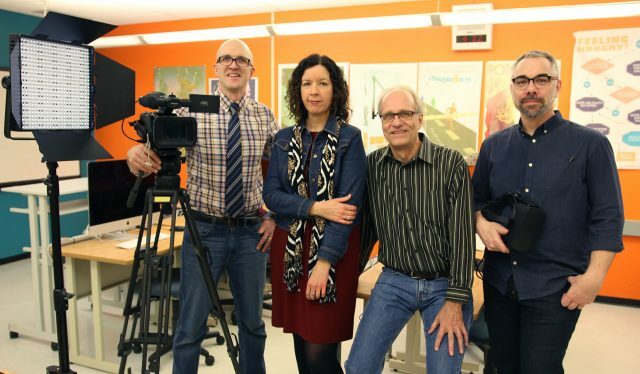 From left are Graham Street, instructor in Interactive Media Arts at Assiniboine, Dr. Rhonda Hinther, Associate Professor of History at BU, Dr. James Naylor, Professor of History at BU, and Derek Ford, instructor in Interactive Media Arts at Assiniboine. The new program is the first undergraduate program in Public History in Western Canada and gives students a total of four new options to earn a degree. Two of these are new four-year majors from Brandon University, with two new 3+1 options also available that combine three-year degrees from BU with a fourth year at Assiniboine to develop media skills. The new program formalizes a relationship that has been ongoing between BU and Assiniboine for several years. Students in the program will take general history and specific public history courses through BU. At Assiniboine, they will gain valuable practical experience, through the media arts programs, in public history production through film, television, website, and video game design and development. While the program has only recently been approved, Hinther and Street have previously collaborated on joint student projects that have produced oral histories of Westman and television commercials for regional museums. Those, as well as new and ongoing projects, will be featured on a new website to be launched this year. Public history projects like these can help make academic theory and study of history more accessible to all members of the public. Graduates are also expected to play an important role in economic development – cultural institutions like museums, archives, and heritage sites where graduates would be working play a critical economic and social role in Manitoba and everywhere and often serve as major draws for visitors to a community. This new joint program helps demonstrate the deepening tradition of collaboration between Assiniboine and BU. In 2014 the institutions, along with the Province of Manitoba, signed Growing Together – Vision 20/20, a memorandum of understanding aimed at fostering collaboration between the two institutions to meet student, community and social needs. With ongoing partnerships that include students sharing residence space and transferring credit through existing 2+2 programs, the institutions continue to make Brandon a city where students can find the options, flexibility and amenities that they are looking for when pursuing their post-secondary education.